As part of its A Renewable America campaign, in 2017, the Wind Solar Alliance (formerly known as the Wind Energy Foundation) hired DGA to co-author a report that examines the need to expand and upgrade U.S. transmission lines to meet the significant renewable energy demand of large non-utility customers, especially from Fortune 500 companies. 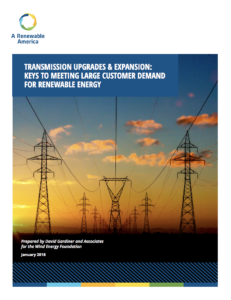 Through extensive research, analysis, and stakeholder interviews, DGA found that transmission expansion and upgrades are needed to enable enough renewable energy development to meet rapidly growing corporate demand for renewable energy. DGA also found that transmission planning fails to account for the rapid increase in corporate and other institutional demand and does not focus adequately on the need to transmit renewable electricity from the central U.S. region to the rest of the country or on remote high-quality renewable resource areas within each region. This report was highlighted in a webinar hosted by Americans for a Clean Energy Grid featuring panelists from Unilever, Midcontinent Independent System Operator (MISO), and DGA. The report was also covered in the press by influential outlets such as Forbes and RTO Insider. Based on findings from the report, DGA organized a letter to the Federal Energy Regulatory Commission (FERC) from five large companies with significant U.S. energy demand—Cargill, General Mills, Nestle, Procter & Gamble and Unilever—asking for continued acceleration and enhancement of the regional and interregional transmission line planning processes to assist in making the U.S. electricity grid more resilient and reliable. DGA will also assist in presenting the report findings to an audience of corporate purchasers at the upcoming 2018 Renewable Energy Buyers Alliance summit. The DGA team was uniquely qualified to undertake this research due to an exhaustive knowledge of the renewable energy industry and network of contacts with renewable energy subject matter experts, corporate leaders, and other large institutional buyers and extensive experience conducting detailed economic analysis and research projects for non-profit organizations, companies and foundations.